FYI, today’s post is not going to directly focus on writing and will include some kind of personal stuff, so feel free to take a pass if that’s not your bag. However, this is a topic I’ve been wanting to write about for a while and thought that the cusp of a new year, when many people are considering major life changes, would be a good time to share my story. The picture on the right is me in October of 2015. I weighed about 140lbs there, I believe. Sorry my face is blanked out; this pic was originally posted on another site. I’m about the same weight today, (December 30, 2016), give or take a pound or two. For most of my life, I was overweight. The lowest weight I remember being was 135 lbs (that’s about 61 kg for my non-American friends), at 12 years old. That number grew steadily as I got older, until it maxed out at around 210 lbs (95 kg) when I was 31 in 2014. That was the same year I broke my ankle during a relatively mild exercise activity – literally jumping up and down. I remember the snap of bone and the flood of warmth to my left ankle. Then the damn thing swelled up so badly, it looked like someone had shoved a grapefruit under my skin. It didn’t hurt until about 10 minutes after – thanks, adrenaline! When I broke my ankle, I was working out approximately 4 – 5 days a week: kickboxing twice a week, about 3 -4 weekly sessions with weights and the elliptical machine at the gym, hikes on weekends, and occasional walks on my lunch breaks at work. (Fun fact: I work out about the same amount now, except now I know what calories are and how many of them I should eat on a given day.) Back then, I ate out for about 75% of my meals – if not more. I didn’t know how to cook and I didn’t care to learn. When I was obese, (and I definitely was obese), I took pride in my lack of knowledge, my willful ignorance. “Oh, I can’t even boil water,” I’d say, laughing, when the subject of cooking came up. My husband and I fought all the time about that old chestnut, “what to have for dinner,” and I don’t really want to think about the thousands of dollars we blew at restaurants. More than that, I ate my feelings. This was behavior I learned as a child that turned into habits I never bothered to examine, let alone break. Happy? Celebrate with cookies! Sad? Here, drown your sorrows in ice cream. You get the picture. When I broke my ankle, I realized that I could no longer keep up my rigorous workout routine, and I despaired. “I’m going to get fat,” I remember crying to my husband. (The irony of saying that while having a BMI of about 35 is not lost on me.) I’d avoided the scale for years. What I saw in the mirror had always depressed me, but I thought I was heavy due to genetics and that there was no point in trying to change. I thought I should just try to love my fat body for what it was and eventually, I’d accept it. Despite my best efforts, this tactic did not work for me. When I had to get weighed prior to the surgery to repair my ankle, I saw the number on the scale, the number I’d been hiding from: 208 lbs. (94 kg) I was stunned. Surely that was too high! Surely the cast added some weight, plus I was fully clothed… But for all the excuses I concocted, (and believe me, I’m GREAT at making excuses), I couldn’t ignore the reality before me. I’d love to say that that was the moment I changed. Right there – BAM. Learned to count calories and dropped the weight. But it took me another several months – and the realization that I was too fat for most of my clothes – before I started those practical things. That broken ankle, though, that was the catalyst for change, so I’m oddly grateful for it. So I’m a big time redditor. (This is relevant, I promise.) 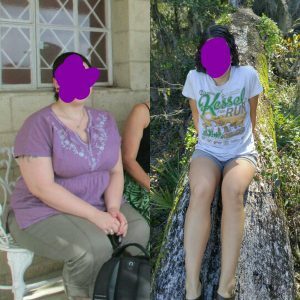 Over the course of my convalescence, I happened upon two reddit forums, one called r/loseit, which is a forum dedicated to safe, sustainable weight loss via calorie reduction, and another called r/progresspics, which is basically a “before/after” gallery of successful weight loss stories from various users. These forums were instrumental not only in my education on the mechanics of calories in < calories out, but they gave me something I’d been lacking for years: hope. These forums, these other users, made me realize that I could change, too. My weight was entirely within my control. That was the “ah-ha” moment. I did everything r/loseit advises in their FAQ, (link): downloaded a calorie counting app on my phone, bought a food scale and a person scale, and got down to business. I won’t go into the nitty gritty details here, because this post is probably too long, but you can see the result for yourself above. However, if you are curious, I made a reddit post of my own right here, that has some more information, though it’s a bit old now. Please also feel free to ask me about it in the comments or via email at lalogareads@gmail.com. Although I’m still working on developing a healthy relationship to food, I’m now at a normal weight for an adult woman of my meager height. I still have some “vanity pounds” to shed, (don’t we all? ), but I’m out of danger for heart disease, diabetes, and the host of other obesity-related complications. I’m prone to hyperbole, but I can say with absolute honesty that my life is 100 times better now than it was when I started this journey. But at first, this self-appointed task was daunting. The idea of losing so much weight, even after I had the tools I needed, was overwhelming, almost impossible to wrap my mind around. It seemed like such a long way to go. But I approached it like I handle every daunting task I face: one step at at time. Just like writing a book, (See? Relevant! ), I took this challenge in bits and pieces. One pound at a time. One day at a time. And though progress felt slow, it happened, and now I have maintained a healthy weight for about 1.5 years. My secret? Don’t give up. Determination, above all else, will get you where you want to go. So if you’re looking down the barrel of 2017 and thinking that change is impossible, please know that it’s not. You can do the thing you want to do,- just take it one small step at a time and. Don’t. Give. Up. I’ll leave you with my favorite quote from my favorite book by my favorite author. This is something that has stuck with me for a long time, and proved especially meaningful during my weight loss journey. Stay awesome, and have a very happy New Year! PS: Obligatory New Year’s fireworks as the “featured image.” I also thought they kinda looked like dandelions in the wind, so that’s cool.